The concept of waste ignores the basic cycles of nature. In nature an output from one system becomes the input of another. On this principle was born the invaluable resource of Freecycle. The Freecycle website is a simple platform where anyone in the world can create a group for their locality, and gain members who can start posting Free and Wanted advertisements for all those things they need or don't want anymore. And of course everything is given free in good faith. Furniture, books, flat screened Tvs, fridges, boats. One persons waste becomes anothers treasure. Our horse paddock has perfect conditions for growing taro. So much so that beautiful black stemmed taro plants had set up home and gone weedy. 30 or more tubers was a bit of a job to dig out when added to our list of other chores to refurbish the paddock. A quick check in bunnings, and I find that these plants sell for $8 or more each. Lacking time and keen for any help to tick a job off our garden to do list, I put a 'Free for Removal' ad on my local Freecycle network. Within two days I had three eager takers sending me emails. I replied to them all, that there were plenty to go round and that they were all welcome to take their pick. Two got back to me. The first were an older couple interested in growing unusual edible plants. They were keen to try their hand at taro. Unfortunately the variety in my paddock was a little disappointing in the tuber size department. But he took a few anyway. "Have you tried Yacon?" asked the man. I replied that I certainly have and were planning a large planting of them. "Have you grown fennell?" Yes, but I don't have any in at the moment. He deposited by my front door step a few days later a bag of yacon, a fennell seedling and two large daikon radishes. The next keen gardeners, two women, had just bought an acre in a nearby suburb and were planning a pond, orchard and vegie garden. They brought a trailer which they half filled with taro. One of them commented on what a lovely plant a yellow hedging shrub in our front yard was. I was looking to move it as, I informed them, we are planning a cottage garden out the front. They were glad, upon my offering to dig up the lot for an instant hedge a their place. "We love freecycle!" They said. In gratitude they offered me a card for their pet minding business. "Next time you go on holidays, we are happy to mind your cat for free." I still had 10 or more plants left. Gumtree is another great website for freebies. Check out the 'free' classified section. It tends to have more landscaping and building giveaways than Freecycle, which has more household stuff. Previously we dismantled an old iron and hardwood shed that was advertised on Gumtree, free for removal. It has saved us $100's on our horse stable build and there's plenty left over for a chook house. I posted an ad and got in touch with yet another passionate gardener, Steve. He cleared out the remaining plants for a school's dry river bed garden. 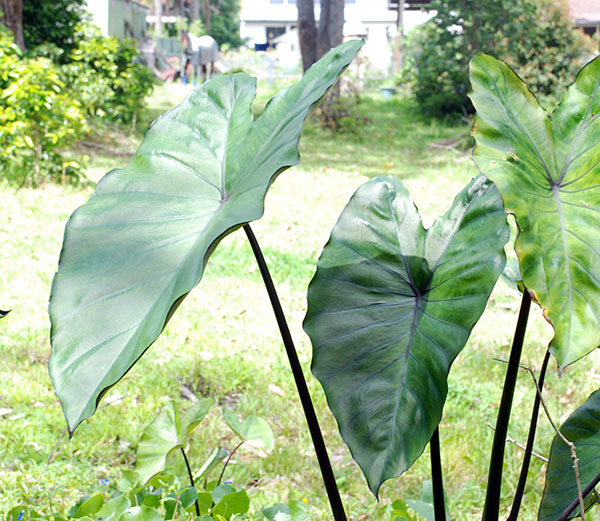 He had collected over 60 varieties of taro alone for the garden, yet didn't have the black stemmed variety. I was so pleased for it to go to such a worthy cause to be enjoyed by many. Another gardener who is keen on exploring the more unusual varieties, Steve offered to help me source any plants I wanted in the future. It seems a fantastic hobby, modern plant finding in our internet age. Sure to be less adventurous than a century or so ago when it meant traveling to exotic places, but no doubt rewarding. Plus he offered to raise a variety of seedlings for a community garden I am involved in. Recycling with Freecycle and other free directories is not only environmentally responsible and a help in my case as I tick off another job done, but as I discovered a fantastic way to meet other like-minded people, in my case, serious gardeners. I was pleased to simply see the taro go to new homes and clear up my paddock. However the generosity of those I gave to makes me realise what a wonderful way it is to share resources. You can join Freecycle for free at www.freecycle.org.